There are following CCNP route exam practice labs. 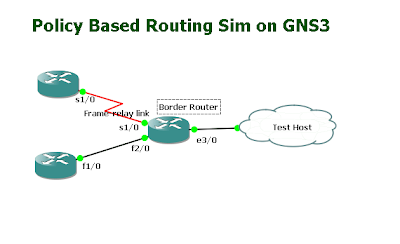 These CCNP Route Labs are designed in GNS3, you can practice these labs again and again in Network Simulation in order to get good exam preparations. All above labs are configured in GNS3 and divided into two section one named with "GNS3 configuration" and other is "Real Exam configureation". Exam configuration section is the part that you have to configure in exam and these configuration are print in pink color in each lab. Hope you will find these helpful for CCNP Route exam. Thank you and wish you good luck for route. Thanks for providing your GNS3 configuration information, it's really helpful for the lab practice.. keep up the good work!! i have clear exam with .vce file which is send from you. Could you please send me .vce exam file to me i am also planning for give me CCNP Route and switch EXAM ASAP. please visit each lab and find its configurations. where i can download above route labs? for the ccnp exam is any bgp lab? On the PBR Lab, if you don't want to set up you computer and connect to the virtualbox, then instead of a cloud, you could use an RTR for the client and configure an IPSLA using a get HTTP request. Worked great for me! Side benefit is that it helps in practicing configuring an IPSLA which is always a handy trick. I set the sequence to run for 25 seconds and got lots of HTTP hits on the show route-map. Just finished writing this exam, I must tell you, prepare hard it is not easy. I got 785,pass score is 790. there is a lab that is not part of the ones you have seen on this site, there are three are areas, router 4 on the far right hand side has a loopback ip in area 1, another interface is in area 0.
you must be able to ping the loopack IP on router 4 from router 1.
router for is locked down so you can't change anything. there are mo virtual links. Hi Can anyone send me CCNP Route lab 's links where i get more CCNP Route lab ques??????? Alhamdulillah! Passed CCNP (Route) with 942 marks. If anyone need dumps and lab simulation contact me. If anyone have latest dumps of CCNP switch plz share. Any new update for CCNP Route (300-101 Exam) Labs? Can you send me the latest dumps to krichmond73@gmail.com? I really appreciate the feeling that you feel to share the knowledge. My CCNA will expire in august 11 of this here and I am already starting to study. Please, can you someone helps to find a better way to do it due to your experiences. Can anyone share the latest route exam 300-101? Please send it to dingyanqiu@hotmail.com Appreciated!! !